We had a shower drain clogged on Saturday morning. We searched positive views and reached out to Hurricane Drain. Roscoe was professional, knowledgeable and affordable. He gave us quick service with a smile. Will definitely use them again DaSandra L.
This company was very professional from start to finish. Punctual, courteous and extremely efficient. They do it all very well. 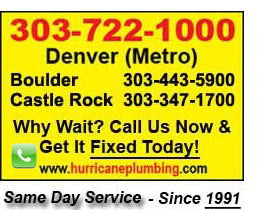 Kim S.
We were very pleased with the service we received from Hurricane Drain & Plumbing. Punctual, knowledgeable, efficient and effective service. Found the prices to be reasonable for the work that was needed. Bob P.
I wanted to let you know what an asset Roscoe is to your company. Thank you for sending someone who was very efficient and worked hard to get the job done. Paul K.